It's lovely so well worth finding Billie lol. 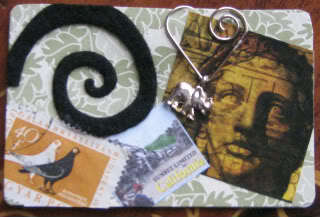 Love that little elephant and the stamps. Lucky it wasn' thrown away, a nice surprise find though. Oooh, that's super. Nice find Billie. I picked up one of my Photoshop books last night that I hadn't read for ages, and the bookmark in it was one of Maria's from 2008, lol. I went through all my other ones to see what swap it was from but could not find any other ones to go with it, I do like it very much. Aww what a lovely surprise. It is so nice to find things that had been hiding, especially when they are as lovely as this.